6:46 am - Thursday - January 3rd - Cedar Key, FL - 67º F, 84% humidity, wind 5 mph out of the southeast.....mostly cloudy today with a forecast high of 70º F. Today is moving day! We roll our wheels in 2 hours. Wednesday was a cleaning day. It has been months since I spent time doing a thorough cleaning of the Newell exterior. The last time I undertook this task was in late August whilst we were still in Southwest Harbor. In the intervening time since we left Southwest Harbor I was mostly able to keep it looking pretty clean by avoiding traveling in the rain, but we ended up driving through a lot of rain on our drive into Campbellsville, and a lot of rain since we left, the worst of which occurred as we passed slowly by Atlanta the other day. As a result the Newell has been looking a little sad lately. Thankfully it was quite overcast first thing so I was able to get quite a bit of cleaning done before direct sunlight, and humidity intervened. By the time the sun came out I had managed to clean the front of the trailer, the rear of the Newell, the entire passenger side, plus wheels, the front, and the two drivers side wheels. It became much too humid to be working that hard outside so I called it quits for the day and headed into the cool, dry, air conditioned interior of the Newell. After we finish repositioning Thursday to Inverness, FL I'll try to finish the drivers side, and the rest of the trailer. The rest of the day was spent napping and watching some more English Premier Soccer. While it only got to about 72º F Wednesday, the humidity made it feel as if it were in the high 80's, and I am not ready to be working in temps that high. As we work our way west I am sure I will begin to acclimate to warmer temperatures, but for now when it gets out of the 60's I surrender. On a positive note it has not rained a single drop since last Friday. Six days without rain in Cedar Key is just what the doctor ordered. 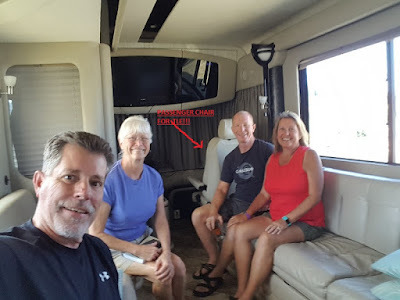 Our reason for heading south another 60 miles to Inverness is to visit friends Richard and Rhonda (1999 Newell). We last met up with them when we were working in Yellowstone the summer of 2017.....you can read about that here. About a year ago Richard announced on our Newell forum (www.newellgurus.com) that he had replaced his wife's passenger seat, and that the old seat, which he had just reupholstered in the prior 12 months, was available for free if someone wanted to make the drive to Inverness to retrieve it. I have wanted to replace TLE's passenger seat for some time with a power version, and knew we would be on the east coast in mid 2018, and in Florida by the beginning of the New Year. Richard agreed to keep it in his garage until we arrived, and that time has arrived. It has been almost a year that Richard has been storing this seat, and I am sure he would like to see it gone soon. There is still a small question as to whether it will fit, but if it does, and I'm about 95% sure it will, we will remove the old seat and install the new one while we are visiting. In less than 10 days we will begin our return trek to SoCal. Our time east of the Mississippi is about over, and within two weeks we will once again be west of the Mississippi, and headed to new adventures.